Grassland Express is one of the most well known bus operators in Singapore. 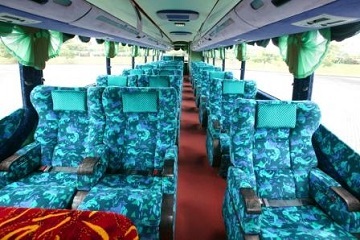 It is famous in providing express bus trips from Singapore to center and northern region in Malaysia. 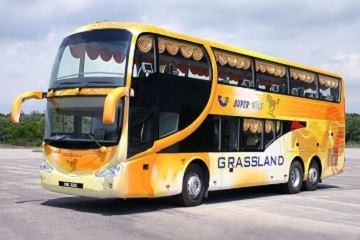 Grassland Express offers many bus trips that depart from Singapore to Malaysia. Bus routes include bus from Singapore to Ipoh, Penang, Alor Setar, Sungai Petani, Bidor, Tapah, Gopeng, Kampar, Teluk Intan, Lumut and many more. The pick up/drop off point in Singapore is at Golden Mile complex, which is only 5 minutes away from Nicoll Highway station (Circle/Yellow Line). In Kuala Lumpur the pick up/drop off point is located in Berjaya Times Square and TBS (Terminal Bersepadu Selatan) in Bandar Tun Razak. Grassland Express buses are renowned with its comfortable seat and ample of leg room. Starting this year, all Grass Express buses will be equipped with WIFI and USB charging ports without extra charges. You can now use your mobile devices on a bus trip without running out of battery! Besides, on board TV are available to keep you entertain throughout the journey. If you are tired and wish to take a nap, the buses are equipped with noise proof setup that minimize loud noises from the engine and traffic. Blk 221 Boon Lay Place #02-128 Boon Lay Shopping Centre Singapore 640221. 101 Upper Cross St. #B1-69, People's Park Centre, Singapore 058357.